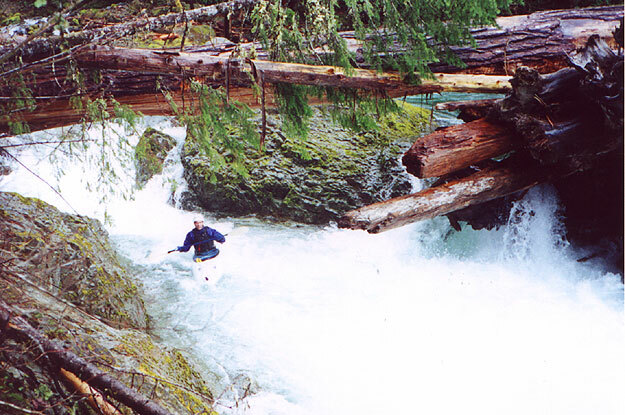 Upper Quartzville is one of my favorite creeks in Oregon, and bears the distinction of being one of the few truly must-do, classic runs in the state. Crystal-clear water, verdant old growth forests, and short, thrilling drops make a first trip down this section an unforgettable experience. Upper Quartzville was once described to me as a 'Disneyland for kayakers' and I would definitely agree with that assessment. The only downside to this run is the access. The road gets blocked by snow in the winter, so you can only run this section in the Fall after a big rainstorm or during spring runoff/rainstorms after the snow clears off the road. That said, when Upper Q comes in, those who are 'in the know' about road conditions and flows head down for a couple of laps on one of the best creeks in the state.. I consider myself lucky if I get to run this section once a year with optimal flows. The run begins with a half mile warm up section and then paddlers arrive at Technical Difficulties, the longest single rapid on the run. TD starts out with a steep boulder garden and ends with an eight foot ledge that we run middle or left. The boulder garden has a piton boulder that has caused some problems in the past about halfway down. Look for a three-foot pourover and boof left here. The rock in the pourover can be spotted from the road far overhead if you look carefully and the flows are right. Pete Giordano approaches the piton spot on technical difficulties. The eight foot ledge is just downstream from the rapid pictured here. Steve Stuckmeyer runs the ledge at the bottom of Technical Difficulties. This is just below the boulder garden pictured above. Immediately below Technical Difficulties is Grocker, a fun ledgy drop that is run on either side though I usually go for the exciting boof over the rock in the middle of the chute. Creekboats with lots of rocker can get some sweet air time here, though in the picture Pete opts for the slot. Below Grocker the creek keeps boaters busy with lots of small surf holes and waves between drops. There's a little wood but nothing too bad. 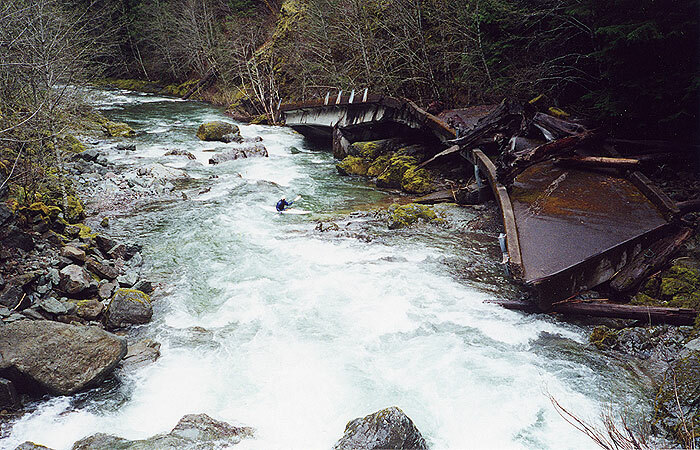 The guidebook talks about a logjam below the first roadbridge, but it isn't there anymore. Watch out for wood, as a log stuck in any of the narrower drops could cause some problems. Speaking of wood, the next big drop below the bridge is Wooden Wall. 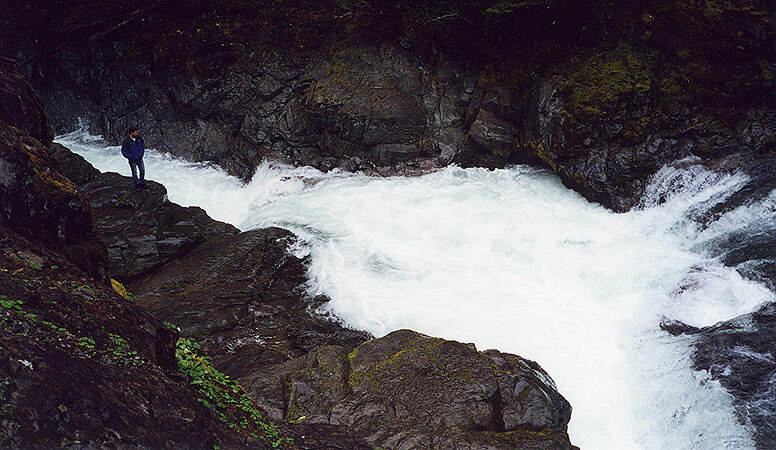 This rapid starts with some fast water and then plunges through a large hole in the middle of the creek. Just downstream extending from the right bank is a large log, which all of the water is rushing towards. 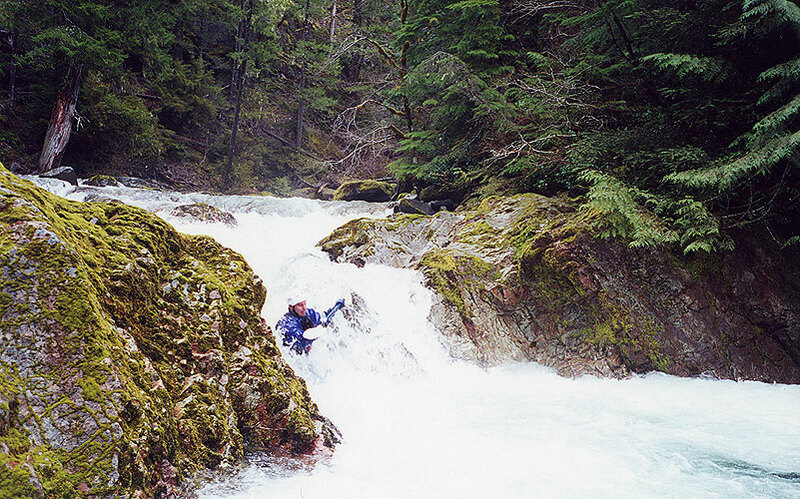 Here Pete punches the hole just above the 'wooden wall' (the log just downstream river right). It doesn't look like it here, but the current is coming out of that hole and going into the log in a hurry! Next is David From Behind (don't ask me, I didn't name this stuff!) one of the most entertaining drops on the stretch. Here you can boof left or go for the gut on the right- a fun airplane turn into a big hydraulic. Keep your elbows in and hang on tight! 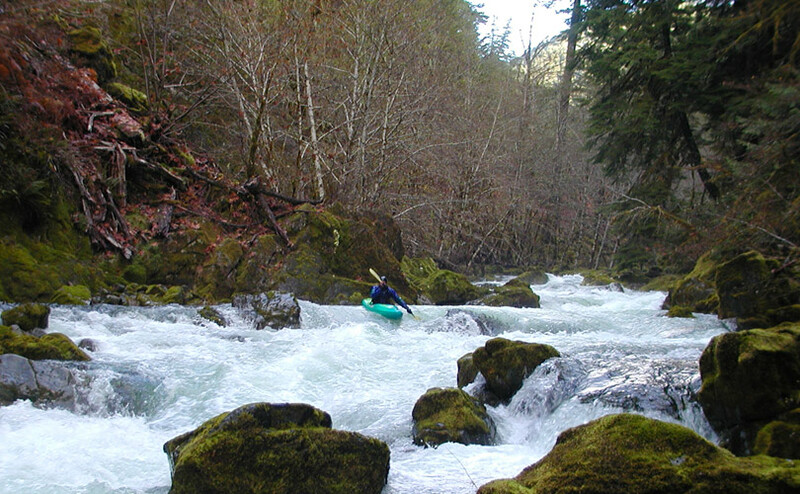 Smaller rapids lead to Corkscrew, which can be spotted by large rock formations on the left. Corkscrew is also very fun, though the current here is a bit pushy- line up and hang on! Immediately below Corkscrew is a drop known as 'Movie Star'. 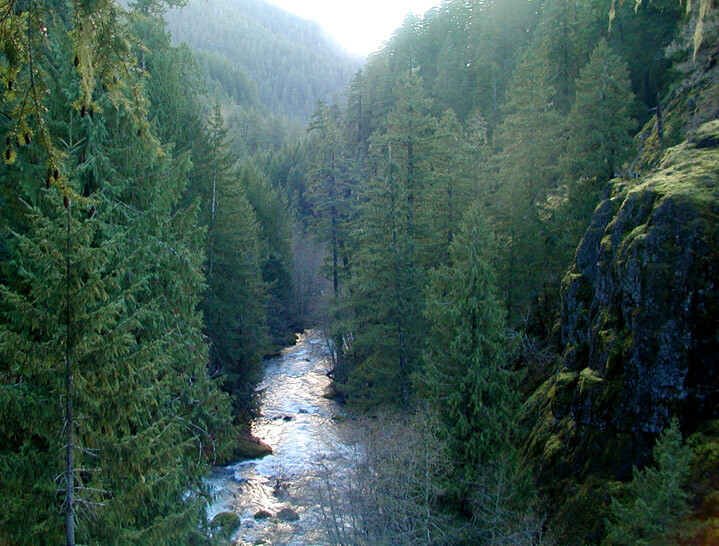 First-timers should scout this drop on the creek-left side. At regular flows ( around 2,000 cfs from rain ) the main line down the left is good to go. 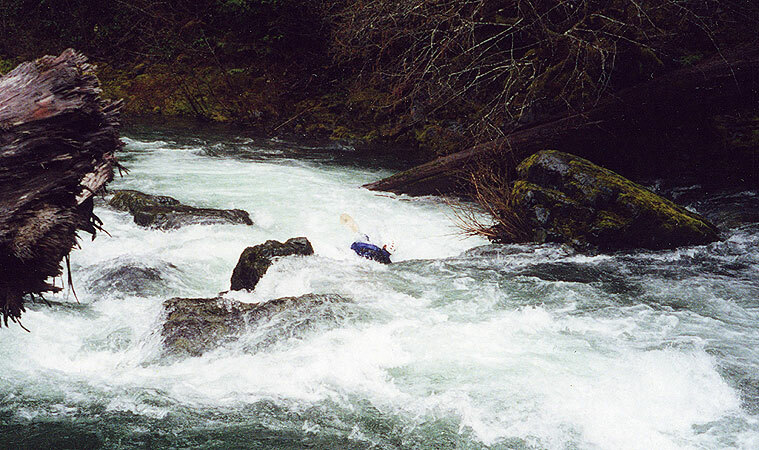 At higher water ( 3,500 cfs and up ) this drop develops a hole that deserves respect. Just above the next roadbridge is a fun ledge that forms a sweet ender spot on the narrower river left side. When we are doing multiple runs down this section we usually take out here because there isn't that much good stuff below. The Author launches out of the ender spot (in a Gradient no less!) I definitely owe Pete a beer for this picture! If you do continue past the roadbridge you will encounter a spectacular sight- Wrapped Bridge rapid. The rapid is small but the twisted wreckage of the old roadbridge (destroyed in a flood) on the right bank is a sight to see! Pete checks out the wrapped bridge. Below Wrapped Bridge is Pick-Up Sticks, a rapid complicated by an enormous logjam blocking most of the flow. This drop can sometimes be run down the right-side chute, but it is often blocked with wood. Boaters should approach this drop carefully as most of the current plows into and under the logs in the middle- if you blunder into this one they won't find you til summer! Pete cruises past Pick up Sticks. THE LINE PICTURED IN THIS PHOTO MAY OR MAY NOT CONTAIN WOOD. APPROACH THIS DROP WITH EXTREME CAUTION! Double Dip should only be run after taking every possible safety precaution. 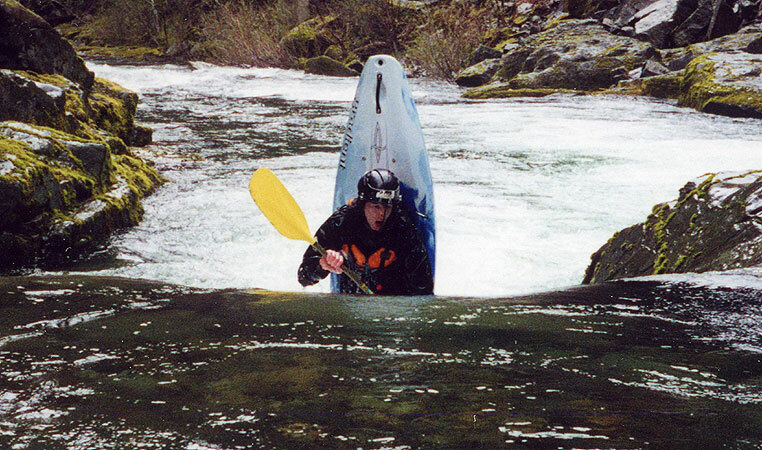 To quote Eric Brown: "Paddlers who run Double Dip often wish they had ended their run a hundred yards earlier." Enough said. 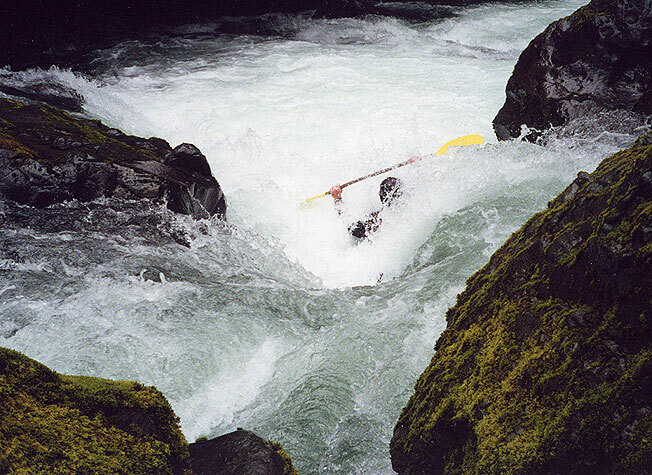 Take out above Double Dip if you don't want to paddle Lower Quartzville. I have run all seventeen miles in one day so it is possible, but expect lots of flatwater paddling on the lower section. Pete Giordano ponders the hideous bottom hole on Double Dip. 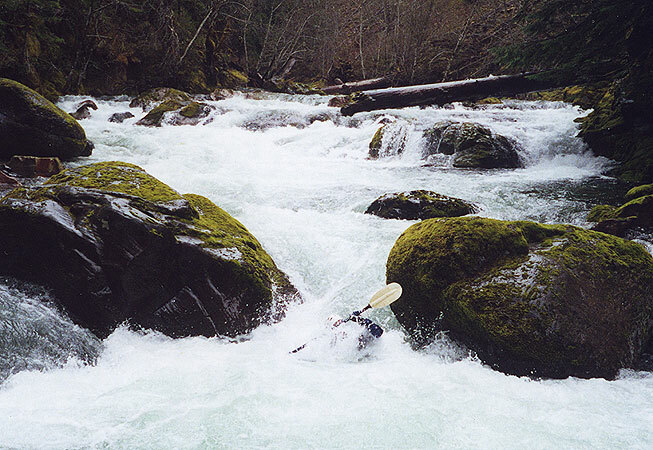 Flows: Determining the flows for this run depends on the season. Because this run is so high up, it either needs lots of rain or snowmelt to run, and calculating a good flow can be tricky due to the location of the gauge, which is many miles downstream from Upper Quartzville (with many tributaries coming into the creek along that stretch). FALL / WINTER (rain) flows: In the falls and winter this run is totally rain fed, and (assuming that the road isn't snowed in, which it usually is all winter long..) 2500 cfs on the internet Quartzville Creek gauge is a good medium flow. You can run this section up to 4000 cfs or higher in the winter, but at that flow it starts to push into the V- range and can get pretty hectic if you're not familiar with the creek. You don't really want to run this section much below 1500 cfs in the winter, because it starts to get pretty scrapy, especially if the snow level drops. 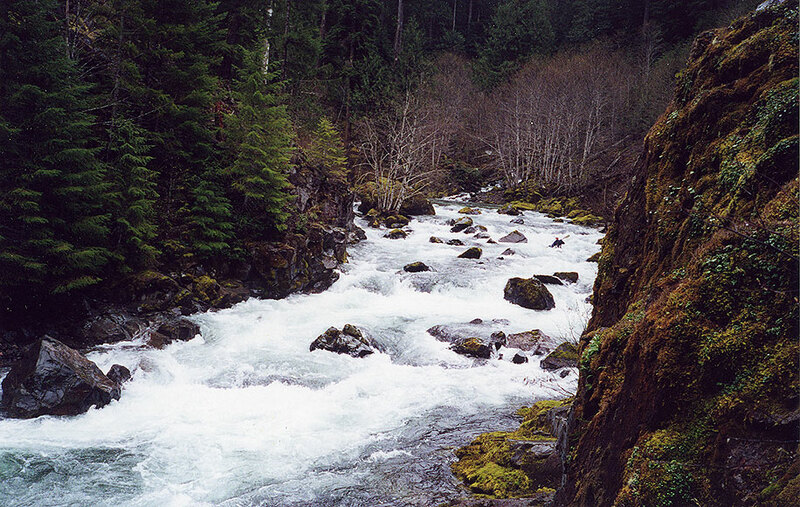 SPRINGTIME (snowmelt) flows: In the Spring, most of the water in the creek is snowmelt and is coming down from upstream, not from the tributaries as it is in the winter. You can have a good run all the way down to 800 cfs on the gauge during snowmelt, and sometimes down to 600 cfs on big snow years. The reason for this difference is the location of the gauge, which is far downstream on Lower Quartzville, just above the reservoir. On Sunday, April 17th, 2005 we ran Upper Quartzville at a good flow, see below for the rainfall patterns. Generally, you need 1 to 1.5 inches of rain in a 24-hour hour window with a high snow level to bring the creek up. 2,000 - 2,500 cfs is the 'sweet spot' from rainfall-induced flows for this section. 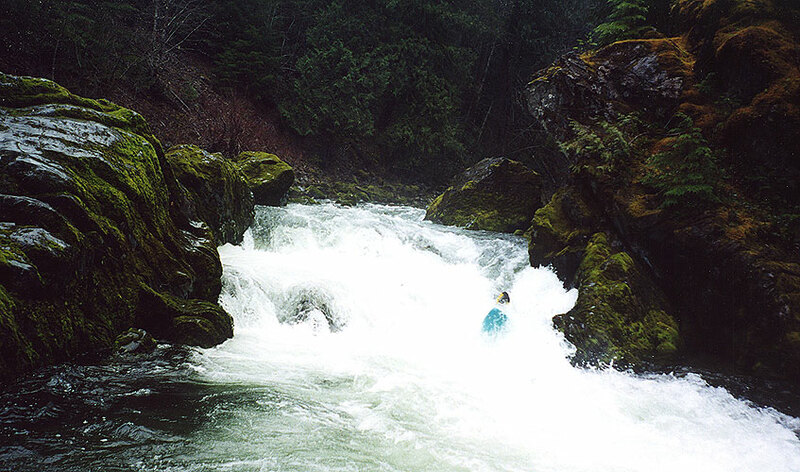 On this day, we had about 1,600 cfs with a high snow level, falling from a peak of 2,000. This was a good medium-low flow, and more water would have been just fine. Remember, the gauge is many miles downstream from the Upper, so you need LOTS of water down there from a rain event for the upper section to be optimal.